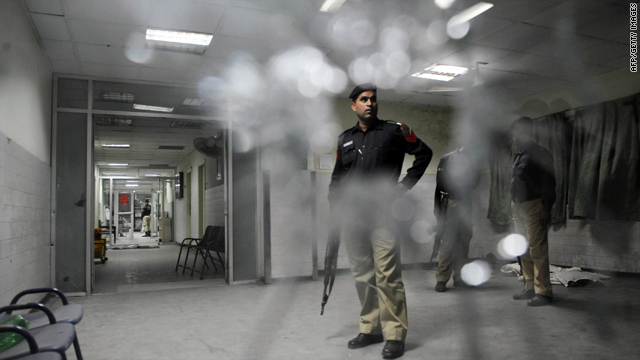 Pakistani policemen search a hospital following the attack at the Jinnah Hospital in Lahore on Tuesday. (CNN) -- Four gunmen opened fire in a hospital in the Pakistani city of Lahore on Monday, killing five people in an attempt to get to a suspect in last week's attacks on a religious minority, authorities said. The goal of the hospital attack was to either rescue or kill the suspect, who was wounded in the Friday attacks that left 98 dead, Tariq Saleem Dogar, the Punjab provincial police chief, told local television. At the time of the shooting, the suspect was being treated in the intensive care unit at Jinnah Hospital, hospital chief Javed Akram said. He has since been moved to a safe place, Dogar said. Hospital officials originally put the death toll at 12. But Khusro Pervez, the city's top civilian commissioner, and Dogar later said four police officers and a security guard were killed. The black-clad gunmen fled the scene after the shooting, said Sajjad Bhutta, a senior government official in Lahore. Pakistani authorities are blaming Friday's bloodbath on militants with ties to the Pakistani Taliban. The group Punjabi Taliban has claimed responsibility for that attack on the worship places of the Ahmedi community in Lahore, a senior Punjabi Taliban leader told CNN Saturday, and threatened to strike the Ahmedis' place of worship again. Interior Minister Rehman Malik said there had been intelligence earlier in the month that an attack could happen in Lahore and that Punjab police did take some steps to react prior to the Friday incident. Then on Friday morning, attackers with bombs and firearms targeted houses of worship in Lahore belonging to the Ahmadi sect, a persecuted religious group. The scenario jibes with Malik's belief that the country will endure more sectarian and ethnic violence. He said he believes "hostile elements" like the Pakistani Taliban and other militant groups "are trying to destablize Pakistan." Most of the dead in Friday's attack -- 75 -- were killed at the place of worship in the Model Town neighborhood. The remaining 23 were killed in the Garhi Shahu neighborhood, he said. Witnesses and officials said the attackers tossed hand grenades and fired weapons, including AK-47s. In the Model Town attack, one of the gunmen was critically injured and another was detained, police said. Ahmadis regard themselves as Muslim, but the government says they aren't, and many Muslim extremists have targeted them. Sunni and Shiite Muslims say Ahmadis are not Muslim because they do not regard Mohammed as the last prophet sent by God. The Human Rights Commission of Pakistan, a nongovernmental organization, deplored the attacks and said it had warned the Punjab provincial government about threats to the Ahmadi community center in Model Town for more than a year. Lahore is the capital of Punjab province. The Ahmadi movement was founded in 1889. Its followers believe that Mirza Ghulam Ahmad, who lived between 1835 and 1908, was sent by God as a prophet "to end religious wars, condemn bloodshed and reinstitute morality, justice and peace, "the worldwide Ahmadi group says. The group, which is thought to number between 3 million and 4 million people in the country, endures "the most severe legal restrictions andofficially sanctioned discrimination" among Pakistan's religious minorities, according to the U.S. Commission on International Religious Freedom. The religious freedom commission, an independent, bipartisan U.S. government body, said in its latest annual report that "Ahmadis may not call their places of worship 'mosques,' worship in non-Ahmadi mosques or public prayer rooms which are otherwise open to all Muslims, perform the Muslim call to prayer, use the traditional Islamic greeting in public, publicly quote from the Quran or display the basic affirmation of the Muslim faith." The agency says it's illegal for the group to preach publicly, pursueconverts or pass out religious material, and adherents are restricted from holding public conferences and traveling to Saudi Arabia for the hajj pilgrimage. While the greatest number of its followers are in Pakistan and India, Ahmadis have a presence in many European countries, such as Britain, where the religion's fifth and current spiritual head, Mirza Masroor Ahmad, resides.